Summertime calls for fresh, easy and quick dinners. Here is one that is super easy to make and super delicious! Baby Salma approved! We’ve all been there…. It’s mid-week and you want to make the most of the little free-time you have with your kid(s) but also have a homemade dinner on your table? Here’s what we did. For this dinner we used the arugula and parsley pesto as a marinade for our salmon. 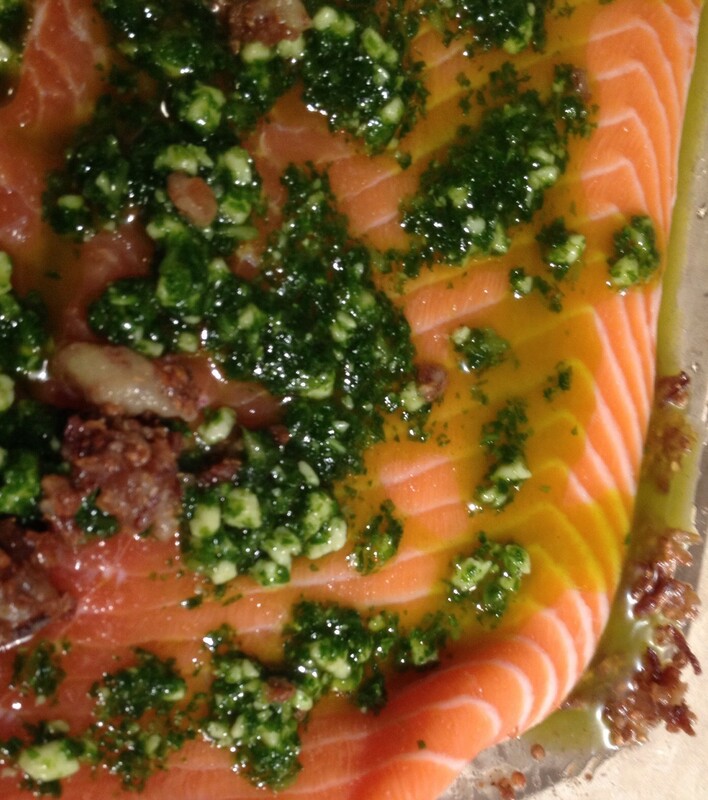 We placed a large salmon filet in a pyrex, smothered arugula & parsley pesto on top. Drizzled some coriander seed oil and popped in in the oven at 350 for 15 min OR sousvide using your Nomiku for 20 min at 52ºC. While the salmon was cooking, we boiled some baby potatoes, and some asparagus, made a quick dressing and dinner was done in under 30 minutes! In a food processor (or mortar and pestle)* add arugula, parsley and garlic cloves and Pulse twice, about 5 sec each time. Add remaining ingredients and process until you obtain a well-blended mixture. *If using a mortar and pestle I would start with garlic and salt. Then adding the nuts. Finally arugula, parsley, parm and slowly incorporating the olive oil. Hope you are enjoying your summer and Happy Eid!